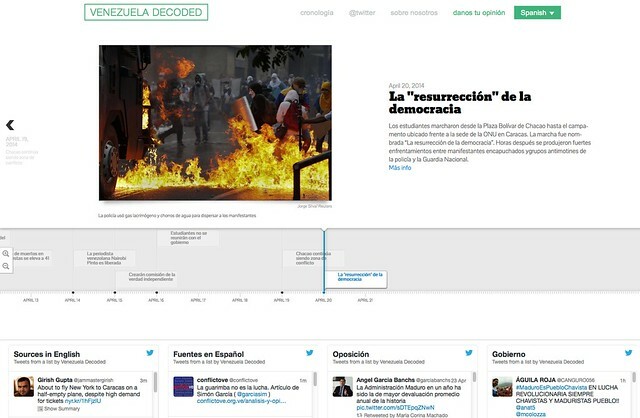 Screenshot of news site Venezuela Decoded, which gathers reports from social media on the current crisis in Venezuela. With the purpose of bypassing the censorship and self-censorship that ail Venezuelan news outlets since the country's mass protests began in February this year, a group of Latin American journalists developed a new site that taps into social media to inform about the crisis. The site was created by Ana María Carrano, Mary Aviles, Douglas Gómez-Barrueta, Martín Quiroga, Eric Ortiz and Martha Olmos, a group of journalists, designers and programmers associated with the John S. Knight Fellowship program at Stanford University that began discussing the project when censorship and self-censorship reports in the country began to increase. "When the conflict began, censorship got worse and we sought a way to respond to incidents like the disruption of cable channel NTN24's signal and the temporary blockage of images shared on Twitter," Carrano said in an interview with the Knight Center for Journalism in the Americas. “People in Venezuela are obtaining their information through Twitter, so we're trying to provide them with a tool they can use to see it all." Venezuela Decoded also aims to respond to other recent type of pressures, like the direct censorship of journalists by their own media outlets, or the shortage of newsprint that has resulted from tight governmental restrictions on how paper and other basic products are obtained. The newsprint crisis has led several newspapers to reduce their circulation or even shut down. Pressures such as these have led many Venezuelan journalists to use Twitter to reveal the stories and details they can't publish through their media outlets. There are also Twitter accounts that publish all the information that is omitted from governmental channels. The goal of Venezuela Decoded is to serve as a hub for all that information. "Information that is not being shared through the regular channels finds other ways to surface through Twitter, like the arrest of Leopoldo López, which was not broadcasted on any channel, as if it hadn't happened," Gómez said. "That day, Twitter was the channel through which people got their information." The Twitter lists that appear in Venezuela Decoded group sources like government officials, members of the opposition, journalists and NGOs. The goal is to tell the story using sources' voices so audiences can form their own opinions and conclusions, Aviles said. "We want to contribute to this with some kind of a neutral space that helps separate information from all the noise in Twitter," she added. "We don't only have the official voices; we also have journalists and citizens. We want to add context to that and contribute with other elements." According to Carrano, Gómez and Aviles, the current crisis in the country has had a significant impact on the Venezuelan press' transition to online. The industry has been slow to move to the digital world, something that became clear during the country's current newsprint crisis. With one of the continent's slowest internet connection speeds and a notably low smartphone adoption rate -- partly because of the high prices and the poor access to certain goods in the country -- Carrano thinks that the lack of online news startups coming from Venezuela is not because of a shortage of ideas, but of opportunities. “The conditions for innovation are not as favorable in the country as they are abroad," Carrano said. "The national conditions do not make the creation of innovative projects any easier." With the current crisis helping propel the move of news content toward social media, the team of Venezuela Decoded believes these platforms will play a crucial role in the future of journalism in Venezuela. "Venezuelan media outlets are in the midst of a very complicated moment because besides having to deal with the political situation they have to learn to adapt to the new digital platforms, and journalists too," Gómez said. Aviles added: “They have to receive data journalism training, and we need more journalists interested in learning these skills." Regarding their own future, the Venezuela Decoded team is planning to continue adding features to the site. In the following weeks they will launch a new site titled "Who's who," in which they will explain who are the protagonists involved in the current crisis. Martín Quiroga, a computer engineer and another member of the team, is looking for more ways to use the information they collect, like analyzing the use of hashtags or detecting patterns, whether in government or opposition accounts. "Another area is geography," he said. "We're looking into how to contextualize what's going on. We want to have a map where we can include all the information to give people an idea of where the sources and information we're providing them is coming from." With more than 5,000 unique visits a day and a Twitter account that already has more than 600 followers, the young news site is quickly starting to build an audience. "We're surprised with how it has been received and the media coverage," Carrano said. "It shows us that there is a real need for this and we're addressing it... The project is barely on its initial phase. The best of it will come soon."